(Cherry Hill, N.J.) – Mayor Chuck Cahn and Township Council are proud to once again offer residents free, live entertainment in July and August at Cherry Hill’s historic Barclay Farmstead. Expanded to five weeks for a second consecutive year, the family-friendly “Music Under the Stars” outdoor concert series will give music fans of all ages a front-row seat to both exciting headliners and up-and-coming opening acts, beginning at 6:30 p.m. every Tuesday on the grounds of the historic farmstead. The fun starts July 7 and runs through Aug. 4. While music is the night’s highlight, there’s plenty else to see and do. The Friends of Barclay Farmstead will offer free, guided tours of the handicap-accessible Farmhouse. A moon bounce will be set up to entertain children; visitors can take a walk along the Barclay Nature Trails; kids can play in the Barclay playground, or take a book to read from one of three Little Free Library sites in Cherry Hill. Mary’s Mobile Diner, Olde City Kettle Corn and Jack & Jill Ice Cream will be on hand, with great food options for purchase. As always, attendance is free; however, this year, we are inviting guests to bring a nonperishable food donation for the Cherry Hill Food Pantry. Kick off the summer with Masquerade, as they play a variety of crowd favorites – from classics to contemporary – sure to please concertgoers of all ages. Enjoy doo-wop and pop music from the 1950s, ’60s and ’70s. Make sure you wear your neon best as we rock and roll to the music of the 1980s! Performing classic Rock ‘n’ Roll, Blues and Soul, the Luck Brothers have written songs for, performed and recorded with some of music’s most recognizable names, including Lou Rawls, Sister Sledge, the Bee Gees, Anita Baker, Lionel Ritchie and more. Dance to the music of the Piano Man with Danny V’s 52nd Street Band, a Billy Joel Tribute Band. The Aug. 4 concert coincides with the Township’s celebration of National Night Out. Barclay Farmstead is located at 209 Barclay Lane, Cherry Hill. Concerts are canceled in the event of rain. Music Under the Stars is supported by the MD Anderson Cancer Center at Cooper, and the Cherry Hill Alliance on Alcohol and Drug Abuse. 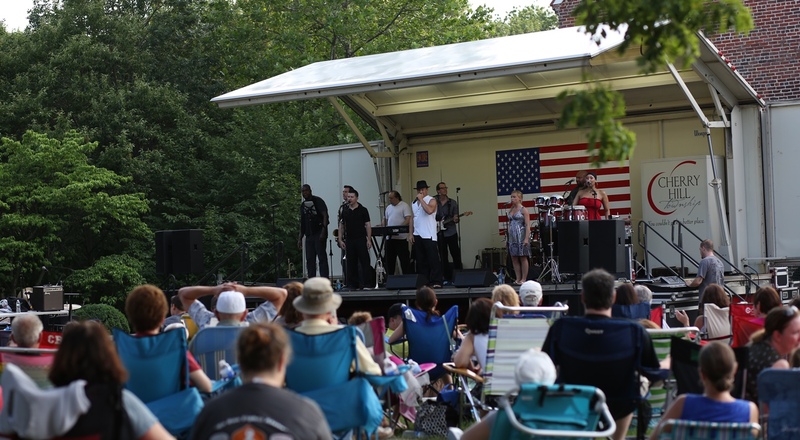 For the full lineup of summer events and activities, visit the Township website at www.CherryHill-NJ.com>www.CherryHill-NJ.com. For more information on Music Under the Stars, contact the Cherry Hill Township Recreation Department at (856) 488-7868 or e-mail Events@chtownship.com.